PROVENCE PRIVATE TOURS, CUSTOMIZE AS NEEDED. Inclusions: Our private tours of Cassis, Bandol and Le Castellet includes private transportation and English speaking tour guide, wine tasting, taxes, tolls and parking. 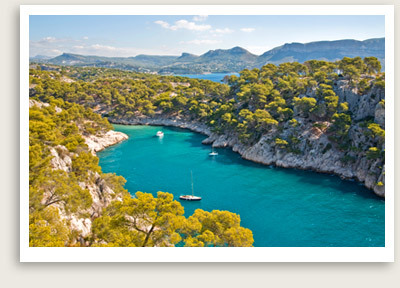 This private tour begins with a visit to the port town of Cassis. This little fishing village inspired such artists like Dufy, Signac and Derain, and continues to inspire visitors today. You can relax sitting at a café near the port, watching the fishermen and street artists. In this private tour of Cassis, you may also take a boat ride to admire the beautiful Calanques, little fjords with high limestone cliffs. Next your private guide will take you to the wine-making towns of Bandol and Le Castellet. Perched high above the plains of the Var, Le Castellet retains its medieval character, with sections of the village’s ancient walls and fortified gates still intact. You will have time to wander the winding village streets, stopping in artisan’s workshops, galleries and boutiques at your will. Le Castellet is known for its attractions both ancient and modern, from its 15th century château to its Formula One racetrack, just a few miles from the village. You will have an opportunity to have a wine tasting at one of Le Castellet’s centuries-old vineyards before moving on to the nearby town of Bandol. The seaside resort town of Bandol was popularized by such writers and intellectuals D.H. Lawrence and Aldous Huxley. Bandol is full of natural wonders, with its many beaches, cliffs, inlets and creeks against a backdrop of hilltop pines and willows. You will have a moment to stroll its port, accommodating 1,500 boats of all sizes, to include yachts, large sailing vesseIs and professional fishing boats. Your excursion will conclude with a toast, as you sample the fruits of Bandol’s vineyards. Bandol’s wineries offer something for everyone, whether you are a red, white or rose lover.